There is a new energy around the Western Michigan University campus and football program this year! It started with the hiring of a new head coach P.J Fleck. P.J is the youngest coach in the NCAA at only 32 years old. A major reason that he was hired was because of his high energy and enthusiasm! Another factor was his vision for the program in the years ahead! Coach Fleck was an assistant on the Tampa Bay Buccaneers NFL team. Before that he assisted for 2 years at Rutgers and 3 years at Northern Illinois. He started out as a receiver for Northern Illinois and played briefly in the NFL. While assisting at Northern Illinois he was in charge of recruiting. This last year with many of his recruits on the field Northern Illinois played in the Orange Bowl game! This is a first for a mid major university! In his short few months here at Western Coach Fleck is already making waves. His 2014 recruiting commitment class is ranked number 28 in the nation at the present time! So what is it about Fleck that is attracting talented kids to play on his team and away from more traditional football powers? What is it that is making Flecks team an exciting alternative to bigger schools with great histories? I believe that they are seeing a complete vision and a place for them to come in and help that vision come true! I have only heard Coach Fleck talk in person one time, but in that talk I came away so impressed and fired up about our program! He brings such an energy level and it is based on a determination that you can’t help to notice! His philosophy starts with three simple words Row The Boat! Athletic Director Kathy Beauregard introduce P.J. Fleck as the next coach! Rowing the boat begins! The row the boat concept had it’s beginnings in a personal tragedy in Fleck’s life. He had a son named Colt that was born with a bad heart. When he was born they knew that they would only have him for a short while. His death was an enormous heartbreak to his family. 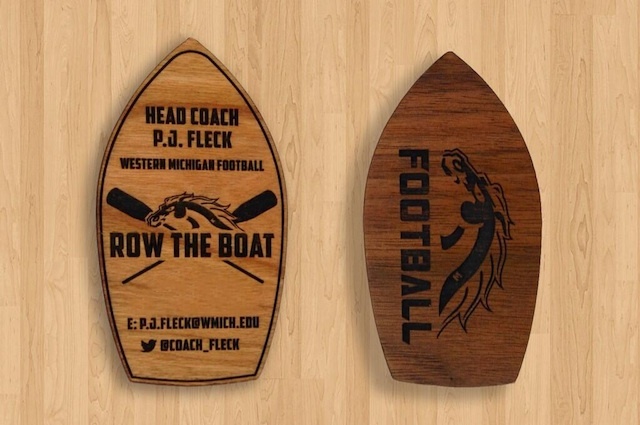 Through it all Fleck came up with his Row the Boat philosophy. Rowing the boat meant to him that no matter what happens (good or bad), he was going to keep rowing the boat. This concept kept him focused on the big picture of life. I guess you can say it is a simple concept. If you have everyone in the boat rowing at the same pace and the same direction, the boat will maximize it’s speed and stay straight. Each person in the boat has to do their part. It’s more than what they can do individually, it is about what they can do as a team. If someone doesn’t row, the boat will zig zag but still get there. If half the people are not rowing, the boat will end up going in circles. Rowing the boat starts with getting a team in the boat. When everyone is in they have to be really in. These are shark infested waters and you can’t be hanging off of the side of the boat and stay intact. Once everyone is in they are given two oars and the practice of working together begins! It may take speeding the pace up to keep up or sacrificing a little of the pace for the good of the whole. Everyone needs to be on the same page with a common goal! Everyone must be consumed with doing their own job and doing it as part of the team! This is Coach Fleck’s business card, made out of wood! Rowing a boat is in fact an act of faith. Each one rowing is facing the opposite direction to where the boat is going. We don’t know what is ahead of us. All we know is what we have already experienced. Fleck talks about the makeup of the boat. He is concentrating his efforts to build a solid dependable foundation. Building fast may work in the short term but with no foundation it would be like building with paper mache. Eventually as time passes the boat will not be able to hold up. He talks about building an old ironsides type of boat that will last through the ups and downs. The oars are tools to make the boat go. The driving force is the people in the boat and how they use the tools they are given. The “R” in the Row the Boat philosophy stand for Responsibility. Fleck contends that responsibility is taking accountability and willingness to pay the price for our actions good or bad. It’s a matter of choices that we make. He maintains that we make a choice of brushing our teeth for instance. If we do this consistantly we enjoy the benefits of nice sparkly teeth. If we neglect this act we receive the opposite results. If one of the players goes out drinking one night and gets pulled over for a DUI charge that is the consequence of the choice they made. If they stay out of trouble off of the field and work hard on the field they will receive positive consequences. The “T” in the Row the Boat philosophy stands for Trust. Fleck contends that every relationship is built on trust. “If you break trust it is very hard to get it back and you will never get it back to 100 percent”, he states. “Most of the world lies by either commission or ommission, either flat out lieing or leaving out bits and pieces.” Within that trust is the belief that you will do what you are supposed to do when you are supposed to do it. Sometimes you may be asked to do a little extra always with the team as a whole in mind. The “B” in the Row the Boat philosophy stands for Belief. Fleck mentioned that you have to believe in yourself, believe in the vision, and be willing to die for the vision. He states that you should love the vision and trust that it can happen! According to Fleck belief can be broken down into two units. The first is attitude. He calls for direct energy much like a lazer beam. Lazer beams are energy directed to one place at one specific time. He urges his players to direct all of their energy to one three or four second play taking one play at a time. The second part of belief is confidence. Confidence in his mind comes from being prepared. One of the knocks against Fleck was that he was so young and he didn’t have the experience that some of the older candidates had. Fleck counters this notion with the fact that he has dreamed of this opportunity and he has prepared himself to be successful in it! He is confident that he can do the job because he has been successful in everything leading up to this point. Although he hasn’t specifically coached a college football team, he has coached position players at college and the professional level. Although he has not overseen all of the aspects of a program, he has overseen the recruiting aspect which is a big part of the coaches responsibility! All of his little victories has given him confidence that he can win the big victories to come! Coach Fleck has a vision and it is more than having a successful football team. It is a vision of giving a vision to the community! He would like to have an oar in every bank, bakery, restaurant, dorm room, and the list goes on. It would be a rallying cry that we all can be successful and would help us to look at the football team’s success as an example! It would be a symbol of support and it would get to the point where people wouldn’t have to ask what it meant, they would know! They would be motivated to do everything they could as fans, sponsors, alumni, coaches, and everyone else that was involved some way with the team. Here are your oars, start rowing. Don’t worry about anything except doing what you are supposed to do at the time you are supposed to do it. I’ve been thinking about the philosophy of rowing the boat in our christian walk! Fleck mentions that the philosophy incompasses much more than football. It could be about a young kid fighting a battle against cancer. It could be any trouble or trial people are going through. Have faith in what you are doing and the purpose of working together and keep rowing. Coach Fleck describes the definition of insanity as “doing the same things and expecting different results.” He vowed that he would not make that mistake with his program. Too many times we Christians get into a similar pattern. We wonder why our church isn’t growing and why we feel like we are seeing the same faces over and over. We wonder why we are not seeing the power of God as we do our same rituals. As Christians we have the boat in place. Jesus Christ is the rock of our salvation. The old hymn states that “on Christ the solid rock I stand all other ground is sinking sand.” The solid rock Jesus can be compared to the boat. 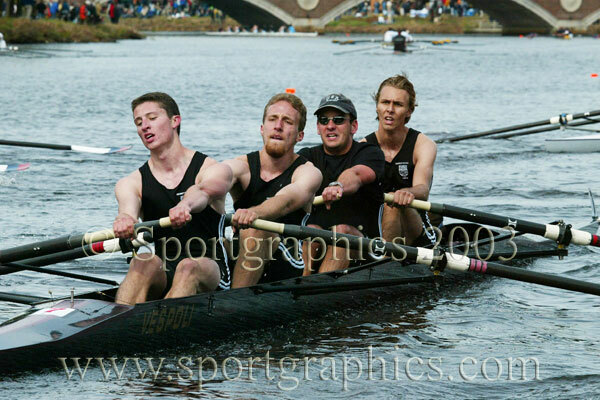 Our boat is made of the finest materials that will carry us through all of lifes troubled seas. We won’t be able to see the future, just as when rowing we can’t see behind us. Yet we know to keep rowing through good times and bad. When the sea is calm or when there is an uprising it should make no difference. We are not controlled by the things going on around us. We are controlled by the vision that God has for our lives. We are controlled by him and the desire to do his will! If we do not feel that passion we need to take a hard look in the mirror and ask ourselves if we are truly in the boat all the way? If God asks us to do something can he count on us to get it done? The oar represents the tools that he gives each of us. Whether it is a gift that we can share with others or a listening ear. Whether it is a kind word we can give or an ability to teach someone something important. There is something that each of us can do! The oar is the tool, but it needs force to make it a useful tool. That is where God’s power will help us if we truly believe! In believing in him and his vision for us we open the connection to his power to help us row successfully! He is our strength in good times and times of trouble! In our christian walk the symbol of our faith is the cross. Imagine those oars in the water as an extension of the bloodied cross that Jesus died on. Seeing his blood stains as a rememberance of what and why we are doing what we are doing can keep us going in the right direction and pushing hard for all that he wants to do through us!! What a marvelous metaphor for life this coach has! This guy was truly born to coach and God bless him! I will Row The Boat! Nice story Lewis I’m very inspired. Be blessed! This is such an excellent post, Lewis! Thanks for always sharing such encouraging messages with us! You are a bright shining light for Christ in this dark world. God bless you!